Emil Kosa Jr., Near Modesto. Oil on board, 1940. The Hilbert Museum of California Art at Chapman University was established thanks to the generosity of Mark and Janet Hilbert, whose superlative collection focuses on the “California Scene” painting movement of roughly the 1920s through the 1970s and beyond. The Hilbert Collection – which includes oils, watercolors, sketches and lithographs of rural and urban scenes, coastal views, farms, ranches, freeways and landscapes of everyday life in the Golden State – is a significant repository of 20th-century representational art by California artists. For more detailed information, please visit our museum website. -You’ll see Ruby’s Diner on your left. The Hilbert Museum is directly across Atchison from Ruby’s, on the right. -Park in front of the Museum. Parking is free, but you must pick up a University parking pass inside the Museum and place it on your dashboard. The California Scene movement is a visual journey through California history: the transformation of California from a wild, untamed Western landscape of rolling hills and vast empty coastlines into an urban industrial panorama, dotted with skyscrapers and New Deal mural projects, and finally into its modern economy based on entertainment, agriculture, international trade, Silicon Valley industries and tourism. California Scene painting, spanning the 20th century, has always been about depicting and embracing new developments in culture and lifestyle. Today, it affirms an emotional connection between the California landscape and its inhabitants, as it tells the stories of everyday people in a changing world. Organized by the Hilbert Museum of California Art in cooperation with the Automobile Club of Southern California. Capturing the beauty of the scenic American West, this is an exhibition of works painted for the covers of AAA’s beloved Western travel magazine by many of California’s greatest artists. The legendary Disney artist and concept designer of the animated Sleeping Beauty movie was also a gifted landscapist. This exhibition displays both his Disney art and his beautiful, stylized landscapes. (in the Motion Picture Arts gallery) Lucasfilm artist Robert Bailey creates realistic graphite-pencil drawings of favorite scenes from the original Star Wars trilogy. A mini-exhibition focusing on the free-flowing pencil work of animation artists from Disney and other studios. The Hilbert Museum of California Art at Chapman University, which opened in 2016, was established thanks to the generosity of Mark and Janet Hilbert. The Hilbert’s superlative collection focuses on California narrative art of the 20th and 21st Century, with a particular focus on the “California Scene” painting movement of roughly the 1920s through the 1970s. 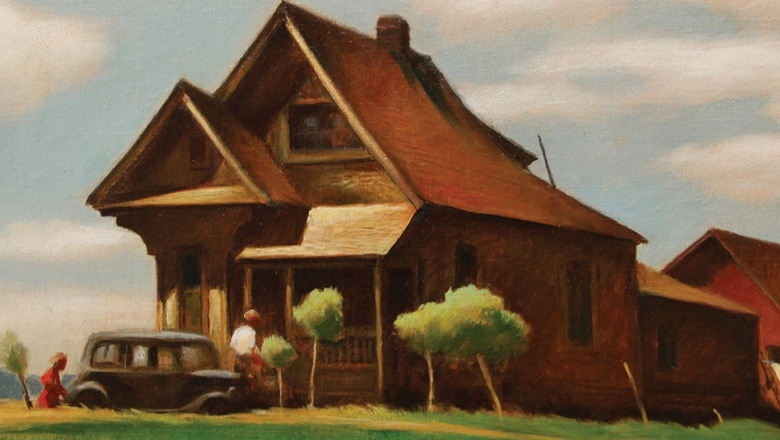 The Hilbert Collection includes oils, watercolors, sketches and lithographs of rural and urban scenes, coastal views, farms, ranches, freeways and landscapes of everyday life in the Golden State; American illustration art; and movie production and animation art.